BELLETRIST: What advice do you have for people who have not yet married or who want to be married but aren’t? DANI: I fear I’m a bit of an expert on this, having been married twice before I married M.. I wanted to be married — particularly in my twenties — because there was some idea I had that this would help settle my life, make me clearer to myself. Of course this makes no sense, but it was how I felt. I wanted a husband because having a husband would ground me. Instead, I married the wrong man (twice) and each time, I felt less clear to myself, less settled. During my brief second marriage I had daily panic attacks, but didn’t know why. I wasn’t being true to myself. And I wasn’t patient. We all want a crystal ball, it’s part of the human condition, but we don’t get to see the future. I couldn’t have known that there would be a moment, at the age of thirty-four, when I would feel that sense of there you are. It’s no accident, though, that the moment came when my life was in an undramatic, quiet, patient place, and I had spent some time getting to know myself and what mattered to me. BELLETRIST: You say you’ve been drawn to the marriages and work of literary couples. We also find ourselves drawn to such people and their work. We think if we look deep enough or long enough clues will begin to emerge. What to do. What not to do. We find flattering similarities and relish in where we feel our relationship is stronger. How ours is ‘better’. Why do you think we are always looking for ourselves in other peoples’ relationships? DANI: I think we do this kind of comparing not only with literary couples, but really with couples in general. With people in general. I remember once, years ago, I went on a three day silent meditation retreat, and while there, I began to see what was going on in the noise in my mind — and what was going on very often was comparing. Am I up? Am I down? Is this person doing better than I am in some way? Is that person miffed at me? It went on and on, this comparing. Horrifyingly so! But it was a tremendous lesson too, in the uselessness of that kind of mental chatter. It’s human nature, but good to try to harness. When it comes to literary couples, there is such a paper trail… so often there are clues in their work, or interviews, or journals. M. and I got to know Rose and Bill Styron in the years before Bill died. Also, Ellen and Frank McCourt. There was a tremendous tenacity to both relationships. I think one difference between “literary” couples and other relationships is precisely that public paper trail. Perhaps Hourglass is my way of controlling that paper trail (this is just occurring to me at this very moment!) so that it’s crafted and turned into a work of art. It’s natural to look for ourselves in other people’s relationships, and either pat ourselves on back, or resolve to do better. What other ways do we have to learn? BELLETRIST: “Show me your search histories and I will show you your obsessions.” This does not bode well for millennials & is absolutely true! What was a pre-internet Rorschach test? Other than a Rorschach test, of course. DANI: Haha, that’s such a great question. There have always been obsessions, and there have always been unconscious ways of cataloging those obsessions. As a teacher of writing I also tell my students that if you show me a writer’s oeuvre, I will show you that writer’s obsessions. Theme is just a fancy word for obsession. If you read my body of work, you’ll know that I am consumed by questions about secrets in families, the power of the unsaid. And, of course, time and memory. But I do think that search histories make anything that’s come before pale in comparison. I mean, you could empty someone’s wallet, or purse, and learn a lot about them. 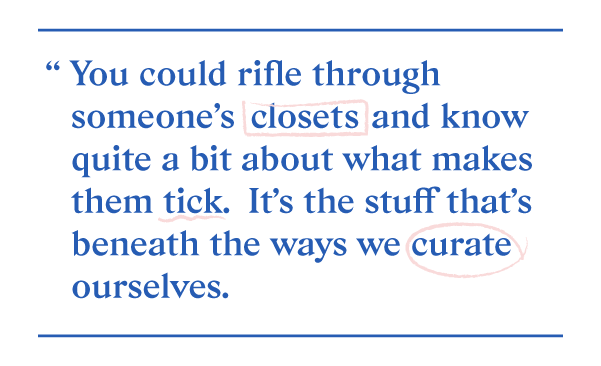 You could rifle through someone’s closets and know quite a bit about what makes them tick. It’s the stuff that’s beneath the ways we curate ourselves. The contents of drawers and whatever is under the bed. Search histories are just that on warp speed. BELLETRIST: You quote Mary Midgley “We are each not only one but also many” we love this because we feel we are different people to everyone in our lives. We've always felt that you choose the person to spend your life with partly based on loving the person you are when you’re with them. We also think you have to like the way they look at you both literally and metaphorically. Do you think some relationships end because you no longer want to be seen the way they see you? Maybe when you no longer fit the person they’ve made you out to be? DANI: That was a central preoccupation for me while I was writing Hourglass — the knowledge that two people simply must grow at different rates, and what happens when one path swerves away from another’s — and what you’re getting at here is an even deeper evocation of that. When we, over a period of years, come to see ourselves differently, or even become different, and that doesn’t jibe with the original tacit agreement or pact (or vows)— what do we do about that? I do believe that’s where some relationships falter and fail. Like, wait a minute, this isn’t what I signed up for. You’ve changed. I feel enormously grateful that M. and I have continued to respect and like the people we’ve become. Not every minute, maybe not every day, but most of the time that’s what we return to. And perhaps it’s also the sense that the people we’ve become have been shaped by one another. When he looks at me, he sees not only the Dani of today, but the Dani he met, and each Dani in between. And I, for him. No one else will ever be able to do that, for either of us. There’s beauty in that. BELLETRIST: How do you know? How do you know that M. is right for you? Is it a daily thing that you know or did you make the decision a long time ago? DANI: The sense that M. was right for me, from the very beginning, did not feel like a decision, but rather, like a deep-in-my-bones intuition. It was something I had never felt before. Oh, I had talked myself into relationships — told myself that it was a good idea, or that someone was good on paper (god save us from “good on paper!”) but when those words, there you are, entered my mind upon meeting M., they were unmistakable because they weren’t thought — they were known. And ever since that first meeting, it has been a daily thing. I’ve never questioned it, even when things are rough. He’s my person. BELLETRIST: What is something in your life that could have happened but didn’t? BELLETRIST:Enlighten us…how do you become comfortable with what you used as the epigraph of your book – letting yourself fall. Has it been true, for you, that the person you have become has always caught you. DANI: It’s true that the person I am now is able to catch me. Certainly not the person I always was. I think perhaps we need to allow ourselves to grow into the people who can become the ones who will catch us. BELLETRIST: Do you believe in “soul mates” ? DANI: I believe that there are people in our lives with whom we have a soul connection: these can be friends, teachers, partners… all kinds of people we encounter over the course of our lives. There’s a recognition when this happens, a familiarity, an ease. I try to be open to feeling it when it occurs. Though I’m not religious, one of my favorite prayers, a Hebrew Sabbath prayer, begins this way: “Days pass, years vanish, and we walk sightless among miracles.” When we encounter someone with whom we feel that soul connection, it is a miracle, I think. And good to take note of it. BELLETRIST: In your book you use this refrain - It could have happened. / It had to happen in regards to M. choosing to live a (arguably) less dangerous, more domestic life with you. And then you ask, we think rhetorically, “Has being with me stopped him from being him?” Was that one of the harder questions you had to ask yourself when writing this book? Do you ever, in real life, dare answer it? DANI: That semi-rhetorical question is in many ways at the heart of Hourglass, and was like a painful, sharp, nearly invisible sliver of glass that pierced me each time I touched it. In writing the book, I was asking the question of both of us, in a way. How have we changed each other, and how have our lives changed as a result of the decision to be together? Have we become more — or less — ourselves? In many ways I think these are questions all couples must come up against, time and time again, over the course of a long relationship. And perhaps asking these questions of each other, and of ourselves, is a part of how we grow. As for daring to ask it, in real life, I think the answer is probably yes and no. M. has become more himself, and less of another kind of self, as a result of being with me. As have I, after all these years of being with him. I feel certain of one thing, which is that neither of us would trade it, even in the moments of pain, or anger, or disappointment. That was another impetus in writing Hourglass — I wanted to really think about that beauty of staying and being formed by another human being, the way water forms rock over time. BELLETRIST: Disregarding the fact that you’re a writer who writes books for a living… why do you, Dani, think it’s important to read? We ask this of all of our favorite writers! DANI: Reading is an exercise in empathy. To read is to enter another world in a way different from any other art form. The reader is actively participating, activating the pages of a book simply by picking it up and beginning. We discover through reading that we are less alone, as the inner lives of characters on the page become accessible to us. No matter how foreign or different a life experience might be, the writer is always saying to the reader, and the reader to the writer, me too. I’ve been there too.